Christopher Hitchens, contributing editor of Vanity Fair, has passed away from pneumonia and complications from esophageal cancer at the MD Anderson Cancer Center in Houston, Texas. 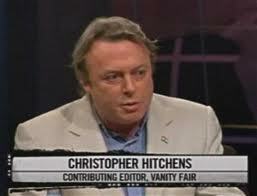 Hitchens passes away at the age of 62 after his long bout with cancer and leaves behind his wife and /…. Just far too young, Rest in Peace. Although I can say I did not agree with much of his politics and his religious views, I can remember the stark reversal Hitchens took with President Bill Clinton and his change of views following September 11, 2001. His views on radical Muslims were spot on. However, one does not have to agree 100% with ones thoughts and views to recognize a brilliant mind and an exceptional writer, with a biting whit second to none. He wrote the anti-Clinton book, “No One Left to Lie To,” at a time when most liberals were supporting the president as he faced impeachment over his affair with Monica Lewinsky. Hitchens also loathed Hillary Rodham Clinton and switched his affiliation from independent to Democrat in 2008 just so he could vote against her in the presidential primary. The terrorist attacks of Sept. 11, 2001, completed his exit. He fought with Vidal, Noam Chomsky and others who either suggested that U.S. foreign policy had helped caused the tragedy or that the Bush administration had advanced knowledge. He supported the Iraq war, quit The Nation, backed Bush for re-election in 2004 and repeatedly chastised those whom he believed worried unduly about the feelings of Muslims. Hitchens was born in Portsmouth, England, in 1949. His father, Eric, was a “purse-lipped” Navy veteran known as “The Commander”; his mother, Yvonne, a romantic who later kill herself during an extra-marital rendezvous in Greece. Young Christopher would have rather read a book. He was a “a mere weed and weakling and kick-bag” who discovered that “words could function as weapons” and so stockpiled them. In college, Oxford, he met such longtime friends as authors Martin Amis and Ian McEwan and claimed to be nearby when visiting Rhodes scholar Bill Clinton did or did not inhale marijuana. Radicalized by the 1960s, Hitchens was often arrested at political rallies, was kicked out of Britain’s Labour Party over his opposition to the Vietnam War and became a correspondent for the radical magazine International Socialiam. His reputation broadened in the 1970s through his writings for the New Statesman. Many more personal remembrances from Michelle Malkin, Ace and the Other McCain. I subscribe to Vanity Fair and most of the time I object vociferously to its left-wing slant. But once in a while it has an interesting article. And even though Mr. Hitchens held views with which I often disagreed, I never failed to read and appreciate his erudite viewpoint. I admired his courage when he spoke out against radical Islam. Few in public life have the intestinal fortitude to inform the American people what we face as our government stands and watches Islam attaining it’s goals of a one-world Caliphate. Not only watching, but facilitating. No one dares describe Islam for the danger that it is. Mr. Hitchens did. He was a man of culture, humor and talent, not to mention courage in his political and his personal battle with cancer. He will be missed by many. I am one of them.